I met you before we ever met in person. On a faded piece of copier paper, in a binder filled with names and qualifications and past experiences, I met you for the first time. And amongst all of those people and all of those choices , I picked you. You came into my life at my lowest moment: after disheartening doctor's appointments, after a false diagnosis, after countless blood draws, and after genetic testing. You entered my world when it consisted of tears and grief and heartbreak and doubt. And I picked you, and you helped me through it. When I was grieving the loss of the child I had imagined, you sat and listened without judgement. You were the first person I voiced my many concerns and numerous fears to. Will my Ceci ever walk? 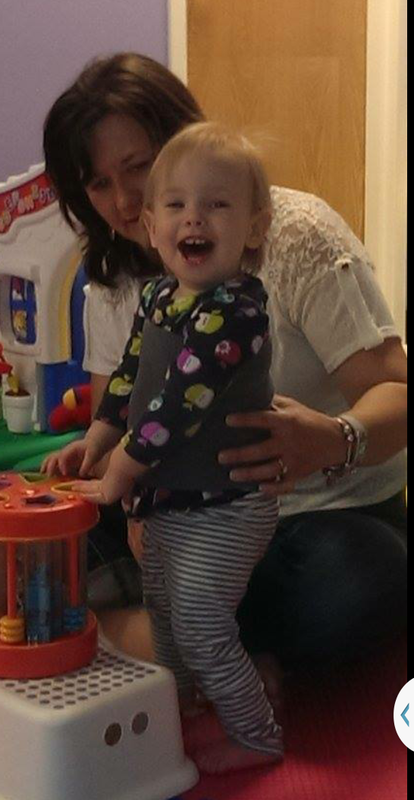 Will we ever know what is causing her hypotonia? Will it ever stop hurting to watch her struggle? Will there be a time when my days are filled with more smiles than tears? And I picked you, and with warmth and compassion you encouraged me. As I was learning to be a mom to my daughter and trying to meet her needs, you were always there to answer my questions. From SMOs to derotational straps...from tummy time to "W" sitting...from ankle pronation to advocating for my child, you provided me with guidance. And I picked you, and you taught me how to be the best mom I could be for Ceci. inchstone in Ceci's life that you haven't been present for. You are one of her biggest cheerleaders. And I picked you, and you celebrated each accomplishment, no matter how small, with us. I watched you with her the other day, Sarah. I watched her smile when you entered the room. I noted how her blue eyes would light up when she looked at you. The two of you giggled together and played dolls. You asked her to work, and she worked so hard for you, because she loves you. And before the session ended, she walked over to you and hugged you so very tightly, and tears welled up in my eyes. I realized in that moment just how much you mean to Ceci and to me. And I picked you to be Ceci's physical therapist, but you have become so much more. You are our family. Sarah has been wonderful. I'm glad I got to meet her!